A few weeks ago I was contacted by Steve from OnTrak who offered me the chance to review their OnTrak PLUS vehicle tracking system. This is the enhanced version of the system Mike Alder reviewed in February 2007 and I have those units in my Triumph Stag. As luck would have it, I had a motorbike trip to Spain in the pipeline, The reason was that my brother has emigrated to Tenerife and the cheapest way to get his motorbike there was to get the Plymouth-Santander ferry, then ride down to Cadiz where Chris would make the final leg of his trip alone on the Cadiz-Santa Cruz de Tenerife ferry, a sailing of a mere 46 hours! His friend Ian was accompanying him and I was roped in to provide Ian with company on the return trip. OnTrak supplied me with a unit ready configured with a SIM card which had £10 of credit on it. This may not sound much but at only around one penny per update £10 actually goes a long way. So, what do you get? This package is quite a bit bigger than the original version, measuring 160 x 85 x 32 mm. It comes in a black (or translucent if you want to show it off) box with no markings and no flashing lights or LEDs on display. You could fit it under the bonnet of many a car and it would look like it was part of the original equipment. Unfortunately I was really struggling to find an out-of-the-way place on my motorbike in which to install it so, for my trip to Spain I simply kept it in the map pocket on my tank. Wiring it up is easy. There are four wires about 40” long, three of which are used to power the device. I will come to the fourth one later but of the three one is +ve supply, one is –ve supply and the third is a switched supply, which only charges the backup battery. They can be wired in any configuration too, the only recommendation being that the earth is connected first. Just as well really, since all the wires are black. On my bike I connected two wires to +12 and the third to earth since I didn’t have time to wire it up properly and also, because it was just loose in the map pocket it meant I could take it with me easily, since I had it connected to my accessories socket. In real life it’s important that one wire is a switched +ve otherwise you will miss out on some functionality. In my case it flattened my motorbike battery, too, as I forgot to disconnect it when I arrived back home. Nine days later I fancied a bike ride and got all suited and booted, but the battery was Dodo-like. Still, a lesson learnt. Anyway, back to the tracker. Inside the box is a double-sided through-plated PCB, backup battery and antenna. It is fully self-contained save the wiring. 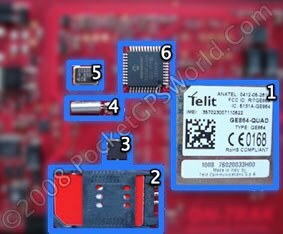 A quick look around the PCB and we can see the main component which is a quad-band GPRS module. Being quad band means it should work anywhere in the world if there is a network signal for your SIM card’s provider. The SIM card is obvious and the small chip just to the left of that is the motion sensor. Further to the right and below is the crystal, adjacent to that is an oscillator and above that is the processor chip. 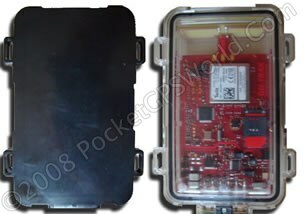 The GPS module is mounted on the underside and has a button cell for maintaining ephemeris data. With devices like this it’s difficult to check things like GPS acquisition times, but as a test, Steve told me when the device was going to be posted and gave me a link to the OnTrak website so that I could track its progress from their HQ in Nuneaton. It got to near Woking before midnight and then the data stops because each day’s data is stored separately on the website. Bearing in mind that it was well packed in a box and was probably in the back of a Royal Mail lorry, I think it’s safe to say that the GPS receiver was working quite well, as was the GPRS radio. Above is the tabulated version of the map shown earlier. Location will be given if some form of address is recognised. Speed and Heading are obvious. TIME will vary depending on what settings are used, whether the ignition is on, etc. In this instance, the device turned on every half hour and, if it recognised a change in position of over 200 metres then it reported this to the website. If no change of position is detected then the information is sent on a two-hourly basis. Est Mileage is ‘point to point’ mileage. ‘Z’ would open Google Maps and zoom to the position you clicked on and ‘M’ provides a mobile map link in 320x240 portrait layout. Voltage is the external supply voltage which is zero because it was on the backup battery and the last column is the GPRS signal strength. There are many user-configurable options with this device. 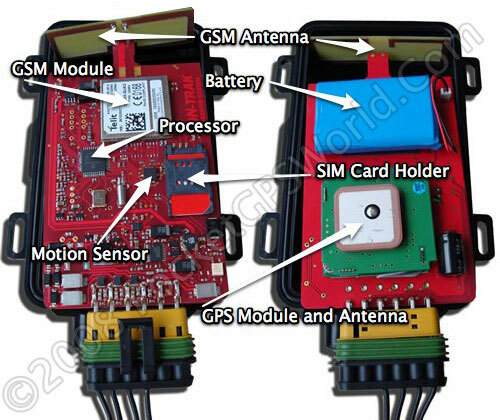 It can send alerts to up to two mobile numbers for activation of the movement alarm, if the vehicle battery has been disconnected or is going low or if an external alarm has gone off. For this last item you need that fourth wire I mentioned earlier. It takes an output from your vehicle alarm (you can connect it to the siren output if you don’t have an auxiliary one) and that is enough for the OnTrak to send out an alert. This is a great idea, I think. Alarms go off all the time and many times people don’t even bat an eyelid. A few years ago with a previous motorbike the alarm failed to disarm at around three in the morning, due to a flat battery in the alarm fob. It used a non-standard battery and I didn’t have a replacement, so I had no option but to call the RAC and get them to take me and the bike home. Of course, when the bike was pushed into the back of the RAC van the alarm screamed like a banshee but nobody made any enquiries as to the legitimacy of our actions. I imagine that many motorbikes are stolen by being pushed into the back of a van but with the OnTrak PLUS, at least I’d get a text to let me know if this was the case. You can poll the device, too, just by calling it and hanging up or by sending a text message. Either way, it will send a text to the phone that polled it with all sorts of information, depending on what preferences are set. You could share the device’s number with your spouse for instance, so that they could see where you are without actually calling you. Of course, you need to be careful who you share the device’s number with as they could alter the settings, disabling or enabling options that you might not want. For me, though, far better than the static positioning resulting from texts or calls is the ability to see something more like real time tracking. When I got the device I created an account on OnTrak’s website and from there you can configure a few more things. For instance, you can set an over speed warning so that if a certain speed is exceeded, you get a text warning about it. Speed is also displayed on the website map by virtue of different coloured arrowheads to represent different speed brackets. The nice folks at OnTrak kindly altered their website display so that I could have the whole of my Spain trip on one picture. Normally you can only have each day’s events on display at a time. While the bike was deep in the bowels of the Pont Aven (Ed Note: that's the ferry!) between Plymouth and Santander, no GPRS signal was available and probably no GPS signal either, so no locations were plotted. This picture is an overview of the journey in Spain. There is a 20 minute gap in the data (to the north-east of Valladolid) which can't be accounted for. However, this only happened once during the entire time I've had the unit. Normally, even where there is no GSM signal, the device buffers events and sends them, most recent first and in 10 minute blocks, at each subsequent transmission until it has all been sent. The buffer can store 2 hours’ worth of updates. I like this satellite view, showing the airport at Gibraltar with the road onto the rock going right through the middle! A nice feature which is only available using Internet Explorer is the Google Earth plug-in view. 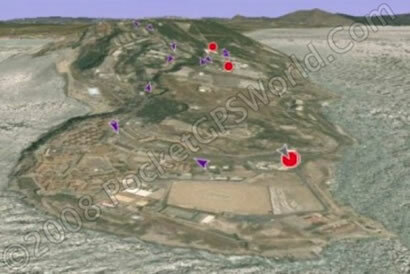 Below is a screenshot of Gibraltar looking from the south, with Europa Point in the foreground. So to sum up, the OnTrak PLUS is a cost-effective way of tracking your pride and joy. Updates using PAYG cost around a penny each which is miserly but OnTrak can also offer a data-only contract SIM for £5 per month which is a cheaper option for those users who require more frequent updates. The website lets other people monitor your progress too, should you wish. For instance I gave my wife my login details so that she and the children could monitor my progress through Spain. They would know where I’d stopped for the night and even where I’d stopped for fuel refills and the like. The unit on test had version 3.14 of the firmware but as part of their ongoing improvements OnTrak now have version 3.21 which has added features as well as bug fixes. I have had one of these units for two or three years and am still over the moon with it. It has transferred from my previous motorhome to my current motorhome and is easy to wire up. The review mentions that all the wires are black. This is not a problem as the unit does not care which of the first three wires are connected to pos or neg. Some sort of 6way diode bridge at a guess. The guys at Ontrak are amazingly helpful and friendly and are constantly upgrading the facilities on the website. I am especially impressed when users requirements are incorporated at no cost. There are also a few firmware updates that increase the available facilities in the unit itself. I hope to have mine upgraded when I get back from my current trip. The unit sends text messages or/and emails depending on the condition triggered. I particularly like the STAY command which is very comforting when I leave my motorhome on a campsite that is not especially secure. A nice touch is the ability to give friends a link to a public map which shows your last position. This gets around the need to give anyone your password. As the review mentions, this unit is very cheap to run and does not seem to be any more expensive when abroad.